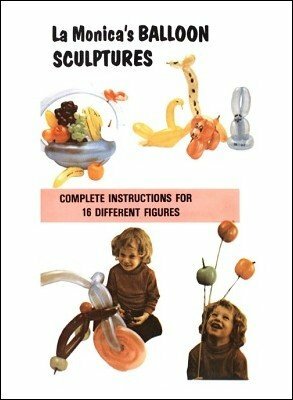 Complete instructions for 16 different figures. Joe La Monica, magician, hypnotist and a leader in the balloon-sculpturing field has added many new ideas to this fascinating hobby. He has proven that it can be fun and profitable to create balloon figures. The color and the action of sculpting with balloons entertain children and adults alike. With the advent of shopping malls, balloon sculpturing has been found to be a traffic-builder and an exciting addition to a shopper's routine. Children, the primary market at the malls, carry the balloons around. Before retirement Mr. La Monica could often be seen at Kings Plaza Shopping Mall, Brooklyn, New York sculpting balloons for children of all ages. Balloons have been a source of pleasure for many years, being synonymous with children and fun. Balloon figures or sculptures came into being a long time ago. According to Charles Marlo, a professional magician, the first person to use balloon sculpturing as a full act was a French magician performing in a Paris nightclub. Lou Tannen, an authority in his own right, agreed with Marlo. Suffice it to say that sculpturing is a seasoned art and over the years its intrigue has never waned. With the advent of the Pencil balloon, a long skinny affair, more areas for shaping were opened to men of imagination. The sculpturing suddenly took a leap forward and many innovations have been presented. George Sands, to mention only one, has contributed much to the art of balloon modeling. Almost every balloon sculptor with imagination has come up with some innovative uses of various shaped balloons. So to say that a particular shape or formation is the sole effort of one individual is unfair. It is a growing art only because ideas are constantly being shared. In this ebook you will find some old and many original ideas. The tricycle, coyote, clowns, horse, monkey, peace dove and many others are La Monica's contribution to augmenting the art. Enjoy them. Once you have mastered the shaping of even one animal you will have established yourself as the Pied Piper of all children's gatherings.